Left Bangkok 2 days ago after an interesting few days to leave for Koh Chang - an Island down south hear to Cambodia. Had a 5 hour coach journey down here which was fine except for possibly the worst ever movie being shown- Myterious Island. I think they chose it simply because it was filmed in Thailand basically some american guy escapes a prison camp with 5 others in 1867 in a hot air balloon, they end up on an island in the ocean which has giant insects, also the guy who plays Professor X is on there and has created an atomic bomb so he can stop global war and an built electric fence to keep out the insects (in 1867), then vinnie jones turns up as captain of a pirate ship to search for treasure and try to kill everyone else then he gets eaten by a giant octopus and everyone else leaves on a raft. I'd srongly recommend watching it if you want a giggle! Anyway back to the island I'm on - it's amazing. 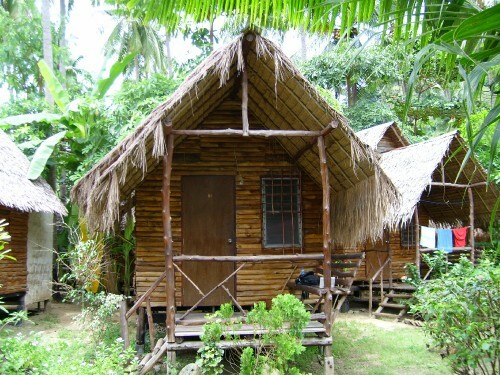 Clear seas, white sand, and staying in a lovely hut on the beach. Met some quality people including a cool german guy (yes they do exist) and a couple of nice Irish girls and got absolutely hammered last night by drinking crazy strong beer and some mad rice spirit that tastes like battery acid. Head was hurting this morning. Planning on staying here for at least a few more days as too chilled to move.